Wall Street's analysts aren't always right, and these three stocks are glowing examples. While Wall Street analysts are smart and intelligent people, nobody is right 100% of the time. Companies beat and miss expectations all the time, and there are always potential revenue drivers or large "one-time" expenses that analysts overlook. Brian Stoffel: IPG (NASDAQ:IPGP) is a leading manufacturer of fiber-optic lasers. Large-scale, industrial manufacturers like the auto industry traditionally use these lasers. Currently, about 22% of IPG shares are being shorted, and I believe Wall Street is finding out right now how wrong it was about this company. On one hand, there's a lot about IPG's business that could cause the short-term investor to pause. Because it relies heavily on global manufacturing to drive sales, weaknesses in any large economy would have some effect on demand for IPG's lasers -- and the global manufacturing industry is highly cyclical. Compounding that effect is the fact that IPG is one of the only vertically integrated laser makers, meaning that when times get tough it's a lot tougher to cut costs. Perhaps part of the market's cold attitude toward the laser maker also had to do with the fact that the company relies on Europe for a bulk of revenue, and has manufacturing facilities in Russia. However, what Wall Street is missing is the fact that fiber-optic lasers are just at the mid-point of adoption, and could easily have applications outside of manufacturing. So even if the global economy does take a turn for the worse, increased adoption rates could help soften that blow. When IPG came out with earnings that far surpassed expectations last week, the stock shot up immediately. Since then, it has continued its upward trend -- which I think is likely due to short-sellers covering their positions. The stock currently trades at 25 times earnings, which I think is more than fair given its growth opportunities. Dan Caplinger: Wall Street isn't too optimistic about Greenbrier Companies (NYSE:GBX), with the company having about 30% of its outstanding shares sold short by those betting against the stock. Yet even though the maker of freight cars and related railroad equipment has seen its shares slump lately, the opportunities in the railroad industry for Greenbrier remain impressive. One reason why investors have turned bearish on Greenbrier is that the plunge in oil prices has caused many to question whether railroads will continue to have high demand for Greenbrier's railcars. In particular, as oil and gas production companies in hard-to-reach shale oil areas looked for ways to transport crude oil to market, railroads bought up all the tankcars they could get, helping to boost railcar manufacturers across the industry. Yet if U.S. producers start to cut back on how much oil they take out of the ground, railroads could see a drop in traffic volume, and that in turn would eat into one of the biggest growth drivers for Greenbrier and its rivals. For its part, Greenbrier said in its most recent earnings report in January that it had seen no cancellations in railcar orders, despite inquiries on the subject from one of its customers. Yet even if oil prices stay low in the future, the resulting surge in demand for other goods could spur railcar growth in other areas, giving Greenbrier a net positive. In any event, such an extreme short-interest position seems unwarranted given the railcar-maker's diversified product mix. The catch? While Core Lab is in the oil and gas services industry, it’s much more of a “tech” company, albeit one that focuses on oil and gas producers. It doesn’t operate expensive oil drilling rigs, or depend on growing production volumes to ensure its customers need to buy more of its products. 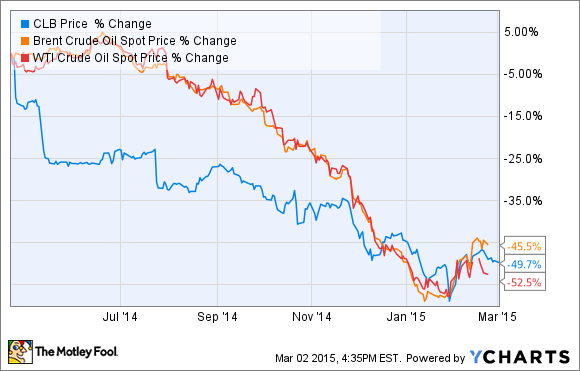 As a matter of fact, falling oil prices could end up being a good thing for Core Lab. The company’s core business is providing analysis and technology to oil producers, which helps them recover more oil. This is more important when oil is near $50 than it is when oil is at $100. Why? In short, Core Lab’s technology helps producers get more oil out of the ground, more cheaply. That matters a lot right now. In the past few months, there have been more than 500 onshore oil drilling rigs removed from operation in America compared to the same time last year. That’s a 28% reduction in drilling activity. Frankly, Core Lab’s services could be more in demand in the coming years than ever, as more oil companies will need to get more oil more cheaply out of the ground. With a trailing price-to-earnings multiple below 19 and a 2% dividend, Core Lab looks like a steal today.